I had the chance to have a few more days off this weekend so I was able to do spend some time getting some sewing and knitting done. 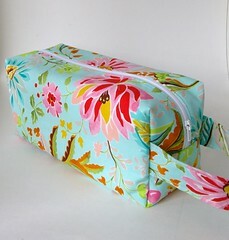 I spent Friday morning sewing 2 box bags. The first one is a trade with Keri, she’ll be sending me some of her coordinating battlets like these, aren’t they the greatest idea! 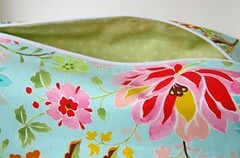 And she’s be receiving this box bag (I don’t want to put up a picture in case she wants a suprise!) I also made another box bag for a good friend who is going through chemo. She doesn’t have much energy for knitting right now but sometimes she does, and I wanted her to have something bright and cheery to hold her knitting. I loved the bright flowers and the pretty sky blue of the background. I hope she likes it! 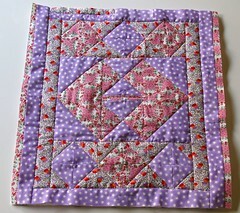 I also did some sewing of quilt blocks that my friend Carol gave me. She gave me a bunch of quilt blocks of different sizes and some leftover fabric and I took it as a challenge to try to piece it together into a quilt top. I managed to put it all together and give it a cute, I hope, look. It’s pretty small, perhaps just over a foot square. It just needs some binding on and it will make a really cute doll quilt. Next up, my 1930’s pinwheel quilt! I’ve worked on both my Noro Kureyon Sock and the Twisted Tweed sock since last time. I’ll have some pictures in my next post. Box bags are so cool – I love the one I have! Isn’t it nice to have a long weekend? The quilt looks very nice and so do the bags.